Rose Farm Cottage, Pouligny Notre Dame, Indre. 4 Bedrooms, Sleeps 8, Changeover Saturdays. Prices from: £595 to £895 pw. Charming Cottage with Heated Pool. Prices From: £250 to £480 pw. La Coudre. Genouilly, Nr Vierzon. Prices From: 350 to 1500 Euros pw. La Coudre. Genouilly. 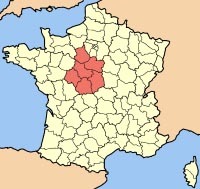 Nr Vierzon. Cher. Set in green and lightly wooded countryside La Coudre is a traditional oak- beamed Longere that has been adapted into two separate self catering gites. Chez Jabier. St. Priest-la-Marche. Cher. Family run fully equipped holiday cottage in the heart of rural France complete with private swimming pool, private fishing lakes, large garden area with \'pets corner\' and your own bbq area. 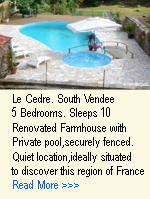 Prices From70 to 100€ per night.